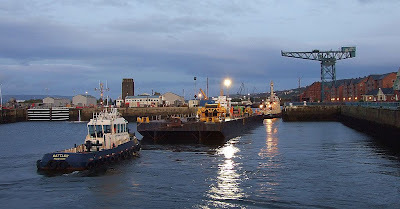 Seen this evening entering the James Watt Dock to seek shelter from freshening weather was the tug CARRON, and the barge E3001, which after working with SOLITAIRE over the past few days had been lying at Fairlie Quay. CARRON is now, as noted previously, owned by Irish owners, Sinbad Marine of Killybegs, where an operating base had been established to provide support for the pipe-layer SOLITAIRE. 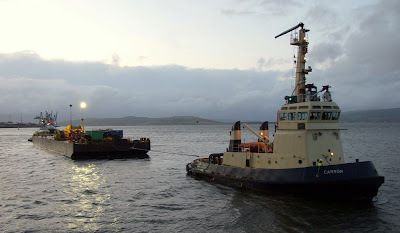 Assisting CARRON and E3001 through the dock entrance, Clyde Marine's BATTLER had been made fast to the aft end of the barge at the entrance to the river channel off Greenock Esplanade. The barge's width is 17.02 metres; the dock entrance is around 20 metres across.